Over 16 years ago I started working for a privately held company that manufactures plastic enclosures and I thought this might be the worst career move ever. Even though Fibox is a global company, with offices all over the world, and appeared very solid with good products and knowledgeable group of people that I had met and interviewed with, who buys plastic boxes??? Needless to say after 16 years of working for Fibox Enclosures USA division I can now answer that question…everyone! Any application or product that needs protection from water, rain, ice, submersion, sleet, dust, corrosion, harsh environments, corrosion resistant or Godzilla needs a Fibox enclosure! First step I learned that it is not just a box! One of the most interesting starting points is the ratings. NEMA stands for the National Electrical Manufacturing Association along with the international IP ratings, Ingress Protection, that vary based on from where the product is going to be used. So many other ratings come into play as well, from UL or cUL to the European CE markings. There are also ratings that are industry as well as country specific. I will be posting a specific blog about this later on in the future to cover this large topic. Second step I learned that the enclosure is not the first thing someone considers when designing or developing a cool new product ~ I am shocked too ~ but no worries since Fibox has over 1000 off the shelf sizes, we are able to help! SIZE – this is the first question we are asked or ask when we speak to a customer. Using a standard off the shelf size has numerous advantages, from cost savings to faster delivery, to getting your solution to market quicker! 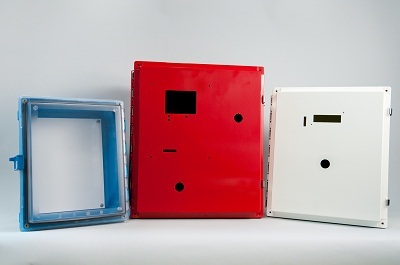 Third step, customization to a standard enclosure can make your product look like a custom housing for a lot less money and improve your time to market. With so many different requirements for each application: from holes to run your power lines through to cutouts for your display to whatever you need. Well these are just a couple of the steps that I have found you should consider when you need your product to be protected and you are looking for an enclosure. In future blogs I will delve into more detailed information on the ratings and customization as well as industry news, trade shows, ISO certification and a host of other topics. Every month I look forward to introducing you to my sister companies all over the world with a couple good words to use in that language. If there is some specific topic you would like to hear more about, please let me know! 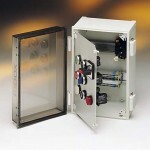 The first thing your customers see is the enclosure. At FIBOX we make sure that your product looks impressive and that your solution is being protected! Needless to say, after 16 years of working at Fibox, it has been a very good career move and I would like to thank all my customers along the way for teaching and letting me be a part of so many cool products out there and I am looking forward to talking with you all about the crazy world of Diane@fiboxenclosures!